The Faroe Islands, situated in the North Atlantic halfway between Scotland and Iceland, still have a bit of the exotic about them. They are an archipelago of 18 volcanic islands with only narrow channels and fjords between them and stormy inlets to access them. From glacial activity, the islands often have steep cliffs, where abundant sea birds nest; the ground perched above these cliffs is covered by green turf on which sheep may graze. But the nearness of the sea at every point on these islands dominates Faroese life. We can get a beautiful picture of this fact from Heðin Brú’s tale of the old fisherman Ketil, his youngest son Kálvur, and his other sons. I was delighted to discover this book, so highly regarded by the Faroese themselves, in The Complete Review Guide to Contemporary World Fiction by M. A. Orthofer, who called it “the best introduction to the Faroes.” The Faroese voted The Old Man and His Sons the best book of the 20th century. I will tell a bit of the story of Ketil and his sons, and then return to discuss further the Faroe Islands themselves and their premier author, Heðin Brú. Ketil and his wife live outside the village of Sørvágur on the island of Vágar, the westernmost island except for tiny, picturesque Mykines. The old couple had 11 children, all of whom had married and left home, but for Kálvur, the youngest, who was a bit of an awkward and apprehensive lad. But being the only son left at home, he reluctantly followed his father and helped as best he could when there was work to be done. As the story opened, Ketil and Kálvur were mowing hay, when the alarm signaling a whale sighting in the fjord led the villagers to drop what they were doing and head to the sea. Ketil and his son “fully equipped themselves. They took along a whale-hook, a harpoon, a length of rope, a casting-stone and a whalespear, and set off.” Although taxis were loading to drive people over the mountains down to the shore, and his son wished to hire one, the old man preferred to walk over the rough terrain directly and save the money. So they trudged along, sweating and straining with their gear, and arrived as the pod of pilot whales was being driven into the fjord. They found a boat that would take them on and joined the hunt. It was a gruesome (and now highly controversial) business, this way of eking out a living from the sea and providing food that might keep starvation at bay. It came with an ambivalence that the villagers, even after many seasons of whale hunts, were still quite capable of feeling. The people on the shore had now fallen silent, for though they rejoiced in the hunt, they were a little abashed at the slaughter, sobered to see the whales so mutilated and dying–those same whales that a little before had been swimming briskly and beautifully, with all the gleam and pride of the mighty ocean upon them. As they surveyed the scene, a whale breached and landed across the boat carrying Ketil and his son. All jumped out in time except Kálvur who went under with the boat but came out all right, with only an injured arm and his own acute embarrassment. Each man who participated in the hunt received a whale ticket which entitled him to participate in the auction of the whale meat. Ketil met one of his friends, old Lias Berint, who gave him some liquor to drink. With his judgment clouded and his own spirits too high, Ketil bid for and won 36 hundredweight of whale meat–3600 pounds! Ketil’s son looked on in disbelief knowing that the cost of this much meat was much more than his poor parents could afford. The bill for this summer escapade would come due the following March to the District Sheriff, who would sell off the household goods of unfortunate debtors who failed to pay up. Ketil’s wife was only too aware of this possible fate, which she had seen befall some of her neighbors in years past. The rest of the story is driven by Ketil’s attempts, along with his wife, to raise the money through strenuous work. Ketil and his son went out fishing numerous times, hoping to make a profit, but often something or someone foiled their efforts. His older sons refused to help more often than not, because they had their own problems or because of the feud between Ketil’s wife and her daughters-in-law. Their neighbor Klávus, who begged and stole food, rather than work for it, was no help either; what’s more, Kálvur kept on giving away meat and fish to Klávus’s daughter, whom he was courting (he was not at all shy with her!). Ketil and his wife bought great loads of wool at the market and spun it into yarn, which Ketil’s wife knitted into sweaters. Although these were sold for a good price, none of these efforts yielded enough to make up for the debt they owed. Ketil rejected his wife’s urging to sell off some of the whale meat, since he feared this would be the last meat he could get for them. Sadly and reluctantly, they sold their only cow to make their payment; the cow had just given birth to a calf but it would be two years at least before she would be grown enough to give the old couple milk. On that forlorn and abrupt note, the story ends. The older generation preferred their plain houses with turf roofs, while the younger folks built fancier, more modern homes closer to town. One time when a squall came up, Ketil’s turf roof started to come off in pieces. He ran to get his middlemost son to help hold it down, but he refused, saying they should just replace it with corrugated iron and save all the bother. Instead, the hardy old men assembled and literally laid their bodies across the turf to keep the roof from peeling away in the wind. It was just expected that they would help each other in this way. It’s not that Ketil’s sons would never help out: they went with him on an expedition to net fish and helped with the cleaning and gutting of the large catch, but they were appalled when the old folks were doing this messy work directly on the dirt floor of their main room! They cleared out the mess and set to work on a plastic tarpaulin with modern tools. Another incident showed that Ketil’s eldest son still looked out for his father. After Ketil’s buddy Lias died accidentally, nasty rumors were spread by one man in the village that Ketil might have done him harm for personal gain. This eldest son gave the rumormonger a thrashing in the street, along with a warning never to slander his father again. Some of the fishing episodes reminded me of Tété-Michel Kpomassie’s experiences with the fishermen of Greenland (described in his memoir An African in Greenland). Both Greenland and the Faroe Islands are part of the Kingdom of Denmark, as self-governing regions. It has been 76 years since The Old Man and His Sons was published and a lot has changed for the Faroes. Both Faroese and Danish are taught in the schools, and the currency is the Faroese króna tied to the Danish currency. Although Denmark joined the European Union, the Faroe Islands remained outside of the EU and negotiated separate fishing rights and a trade agreement. Because of worldwide protest led by environmental groups such as Greenpeace, who continue to call for a ban on whale hunting, the hunting of pilot whales has been regulated to some extent. The meat cannot be sold but must be shared out in the community according to a complicated system based on local customs and priority. This acknowledges the needs of these small communities who may not have enough to eat otherwise. The fishing industry, however, is still the primary economic engine of the Faroese economy, although they receive substantial subsidies from Denmark. I don’t want to leave the subject of these islands without showing their beauty. Here is a view toward the fjord of Sørvágur, where the novel was set. Sorvagur on the island of Vagar, with a view toward Mykines. Credit: Arne List. Photo: Erik Christensen. Sørvágur is not far from the Faroe Islands’ only airport. All the other islands can be reached by ferry, car, or helicopter. A tunnel has been built connecting Vágar with the big island of Streymoy, which has the capital city of Tórshavn, another one connects Eysturoy and Borðoy, and more tunnels are in the works. About 48,000 people live on all the islands, with double that number of sheep! I have learned a lot about the Faroe Islands (including that fact about the sheep) from the latest (4th) edition of the Bradt guide, and I highly recommend it for the quality of James Proctor’s writing and the depth of information and history it offers. Plus it has this beautiful cover with two stunning gannets in their splendor. Birding is one of the chief attractions of the Faroes, and seabirds of many kinds–puffins, kittiwakes, fulmars, storm petrels, and more–can be found on cliffs and slopes of several of the islands. As the author says, coming across a large group of them at once is an experience both exhilarating to the spirit and pungent to the nose! The bright colors in which most buildings are painted make even a small seaside village a photographer’s delight. For me the timber churches with their turf roofs are among the most beautiful. Here is the Funningur Church on the island of Eysturoy. Funningur Church, Eysturoy, one of 10 remaing old wooden church on the islands. Photo: Vincent van Zeijst. Heðin Brú is the pen name of Hans Jacob Jacobsen, who was born in Skálavík (Sandoy) in 1901 and died in 1987 in the capital city of Tórshavn. Besides writing The Old Man and His Sons (Feðgar á ferð), along with other novels and many short stories, he was also a prolific translator, with Faroese translations of Hamlet, The Tempest, The Brothers Karamazov, Wuthering Heights, Grimm’s Fairy Tales, and other works, to his credit. In 1988, a commemorative stamp was issued in his honor. Faroese Writers: Heðin Brú. Stamp FR 165 of the Faroe Islands. Engraving: Czesław Słania. Date of issue: 6 June 1988. 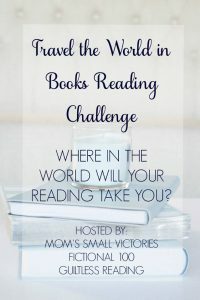 This review was inspired by our “island adventure” in June for our Travel the World in Books Reading Challenge. Tanya of Mom’s Small Victories invited us to pick a book set on an island, and she compiled this amazing list of 35 Best Books Set on an Island. You will find some new and classic island novels (most set in warmer climates! )–perfect for planning your own island reading adventure. This entry was posted in Literature, Travel and tagged Book Reviews, Faroe Islands, Faroese literature, Heðin Brú, Travel the World in Books. Bookmark the permalink. I really enjoyed this review–first the story–it sounds like a fairy tale, but one so relevant and real. I loved the pictures and the info you provided about the Faroe Islands, and it was interesting to read about the author and his translations, especially of the Brothers Grimm! I think you are very right about the fairy-tale quality of the story. Instead of selling his cow at the beginning for a handful of beans, he sells it at the end–for a whale! His interest in Grimms’ fairy tales (and his likely acquaintance with Andersen’s in the Danish) suggests an affinity with that kind of storytelling. Thanks, Jane! Fantastic! I’ve added it to my to-read list.